The Fireblade's competitors will have serious difficulties.... Engine is bigger 954cc and dry weight droped down on 168kg. Frame is stiffer and intake grew up from 40 on 42mm. 2002 Blade came round to its original wildness. Racer will surely fastest on GSX-R. But who can use the possibilities of the bike on 90% Blade will be unique. Contrary former model is much better, has higher power, sharper controllability and better riding position. 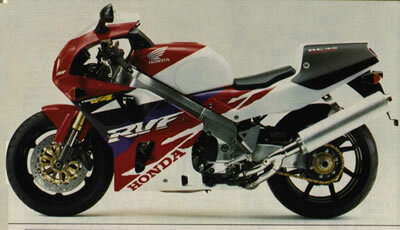 And what is very important the bike give great amount of confidence in what is not GSX-R1000 so good. Also Yamaha introduced new R1. About R1 everyone talks in superlatives. Unfortunately for Honda after all the changes it's still not enough... For first place still competing R1 and GSX-R. In spite of Blade is still best selling bike. Fireblade obtains customers by wide spectrum of capabilities. You can use it such race replica, sport tourer and even for everyday riding.